Website and processes: 5 Jan 16 sharon mc monagle, 5/5 Excellent "class very easy to use "
If you are thinking about taking up gliding and are looking for a starting -place this could be it. Experience consists of 15-20 minutes soaring or 2 non soaring flights. If time permits during the flight you will be instructed on the effects of the controls, and should you wish, you can take the controls and fly the glider yourself. The launch will be by our modern powerful winch, and as the glider levels out at the top of the climb you will hear and feel the instructor releasing the cable, as your flight over the beautiful Essex countryside begins. 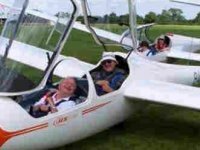 It may be permissible to use a camera, but if you do take a camera you may not be able to fly the glider during the same flight. A full three calendar months'temporary club membership is included in the price of the trial lesson, so you may return again within that time and fly at club rates.